U.S. Secretary of the Interior Ryan Zinke announced on Oct. 24 a long-awaited development for oil and gas energy production offshore the state of Alaska. 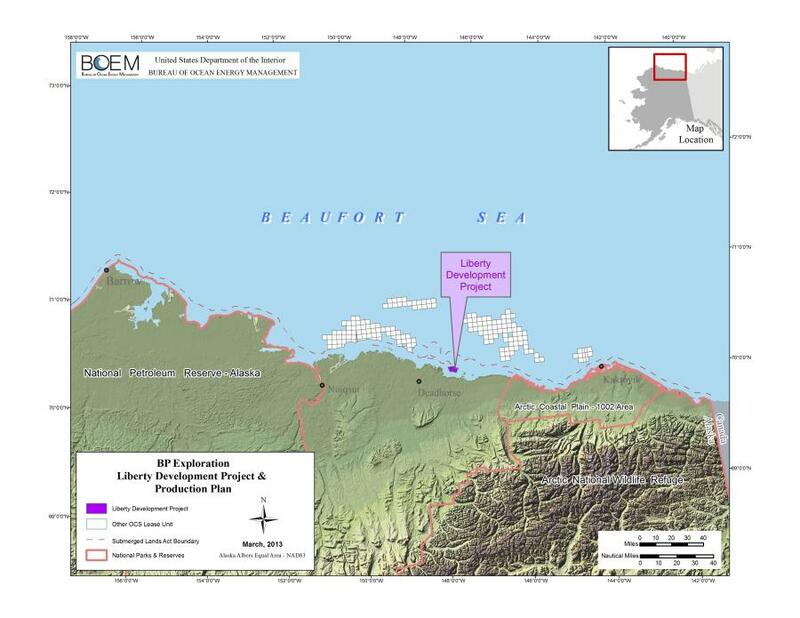 Interior's Bureau of Ocean Energy Management (BOEM) issued conditional approval to Hilcorp Alaska LLC for its Liberty Project oil and gas development and production plan. If developed, the facility would be the first oil and gas production facility in federal waters off Alaska. Hilcorp proposes to build a 9-acre artificial gravel island in the shallow waters of the Beaufort Sea, about 20 mi. east of Prudhoe Bay and about 5 mi. off the coast. The facility would be similar to the four oil-and-gas-producing artificial islands currently operating in the area's state waters: Spy Island, Northstar Island, Endicott Island and Oooguruk Island. "Working with Alaska Native stakeholders, the Department of Interior is following through on President Trump's promise of American energy dominance. Today we're announcing approval of the Hilcorp Liberty Project, which if completed, will be the first production facility ever located in federal waters off Alaska," said Zinke. "American energy dominance is good for the economy, the environment and our national security. Responsibly developing our resources, in Alaska especially, will allow us to use our energy diplomatically to aid our allies and check our adversaries. That makes America stronger and more influential around the globe." "There are already four other gravel-island facilities off the North Slope, and we consider Hilcorp's plan to represent a relatively conservative, time-tested approach toward offshore oil and gas development," said Joe Balash, the Department of the Interior's assistant secretary of Land and Minerals Management. "Using input from North Slope communities, tribal organizations, and the public, we have developed a robust set of environmental mitigation measures and safety practices that will be applied to this project." In August, BOEM published an Environmental Impact Statement that examined the potential environmental impacts of Hilcorp's proposal, and looked at a range of alternatives. Today's announcement follows publication of the Record of Decision issued by the Department of the Interior. The Record of Decision, BOEM's letter of approval and related documents can be found at boem.gov/liberty.